Recently our family has been counting calories, exercising more, and trying to lose weight. We’ve been working hard for three months now and thankfully it’s starting to pay off. We’re both feeling better and hopefully looking better too! Counting calories gets old though, and often ANOTHER salad for dinner starts to get boring. That was until I discovered Eat Smart Gourmet Vegetable Salad Kits. 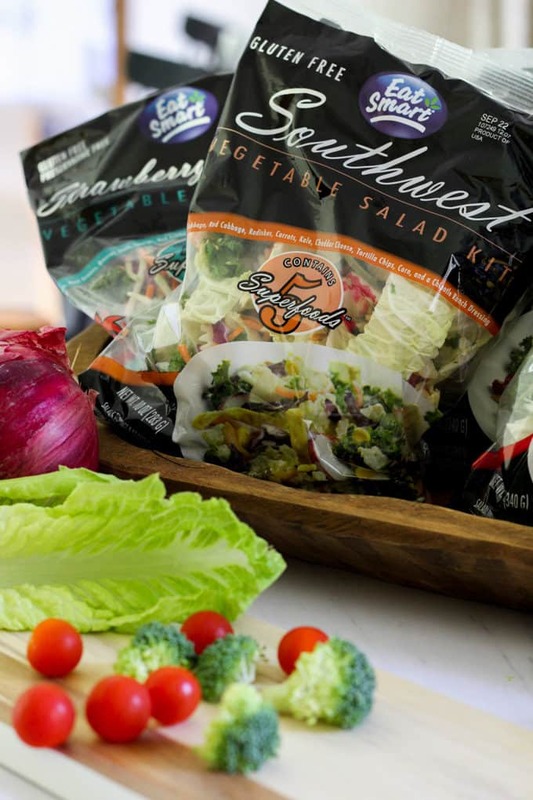 These Salad kits are not your typical bagged salad. 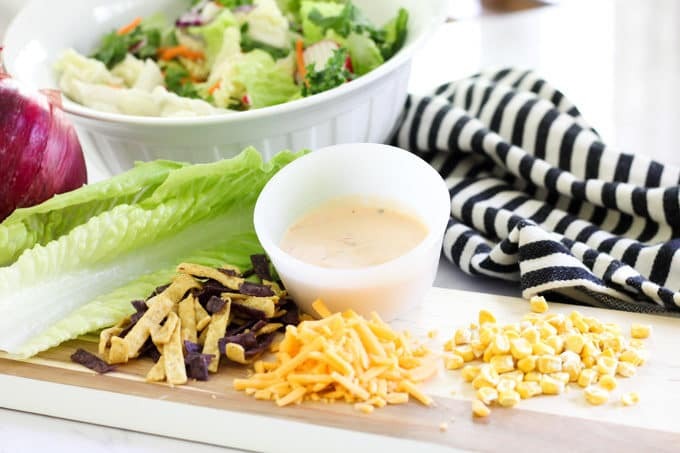 Each salad is a convenient, delicious way to eat healthy everyday. They’re filled with healthy high quality ingredients that make daily salads a lot more interesting. 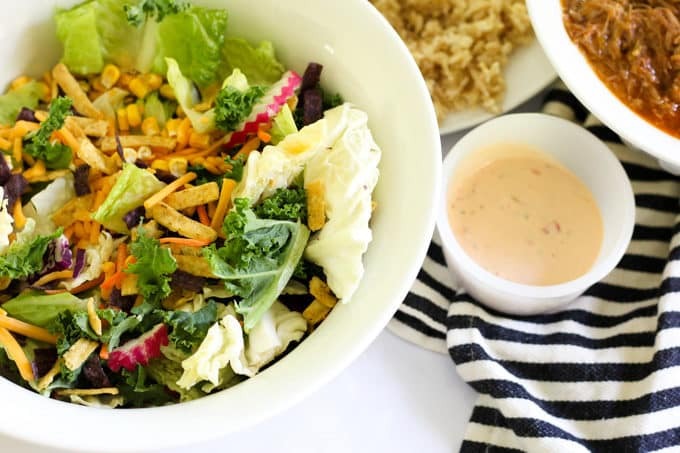 These salads have become a staple around our house. 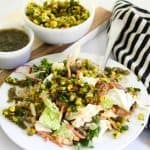 Sometimes a salad doesn’t feel like an entree though, and often we find ourselves adding a chicken breast or fish to these salads to add some protein. 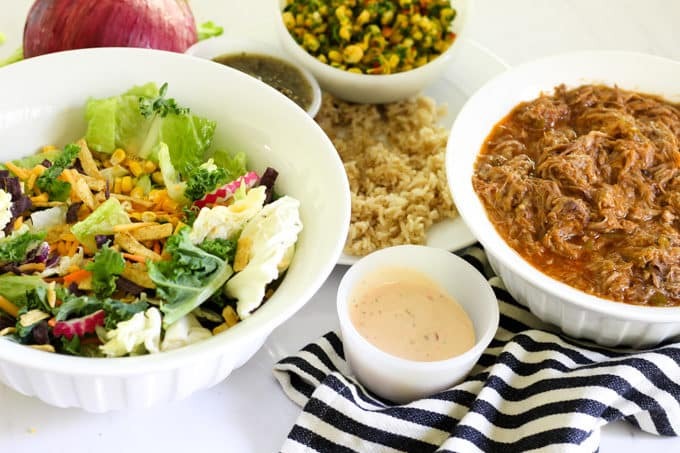 Last week we added my famous pulled pork and corn salsa, which put the Southwest Salad over the top. Place pork roast, 1.5 cans Coca-Cola, 1 c. brown sugar, and 1 T. Garlic Powder in crockpot and turn on low for about 8 hrs or until pork is ready to shred. 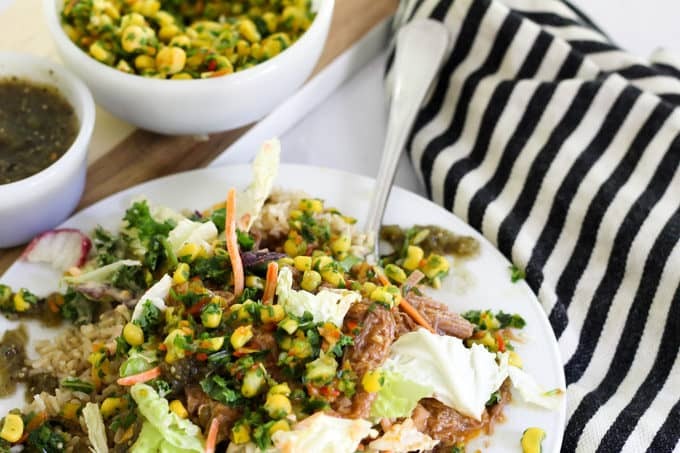 Pour sauces out of crockpot. 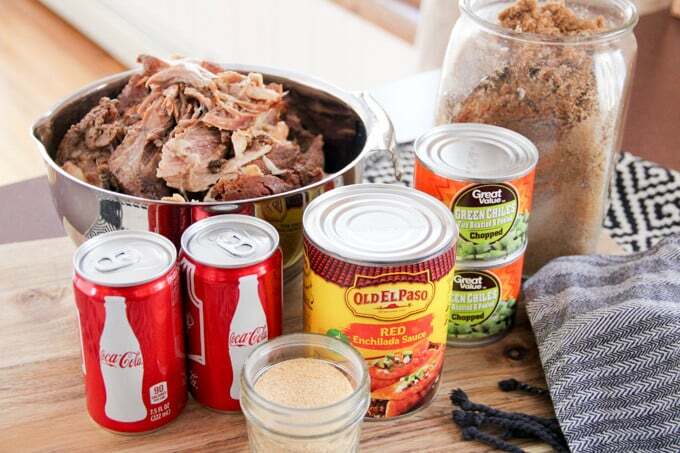 Add 1.5 cans Coca-Cola, 1 c. brown sugar, 1 T. Garlic Powder, Green Chilis, and Enchilada Sauce. Cook until warm. 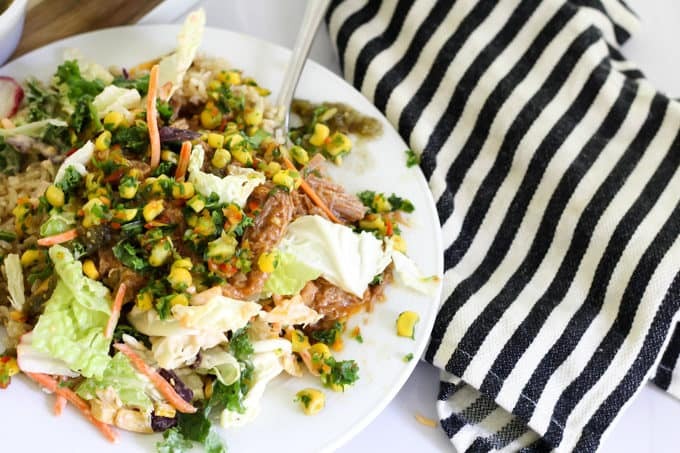 The pulled pork recipe makes a LOT, and typically I ALWAYS have a bag ready to thaw in our freezer. 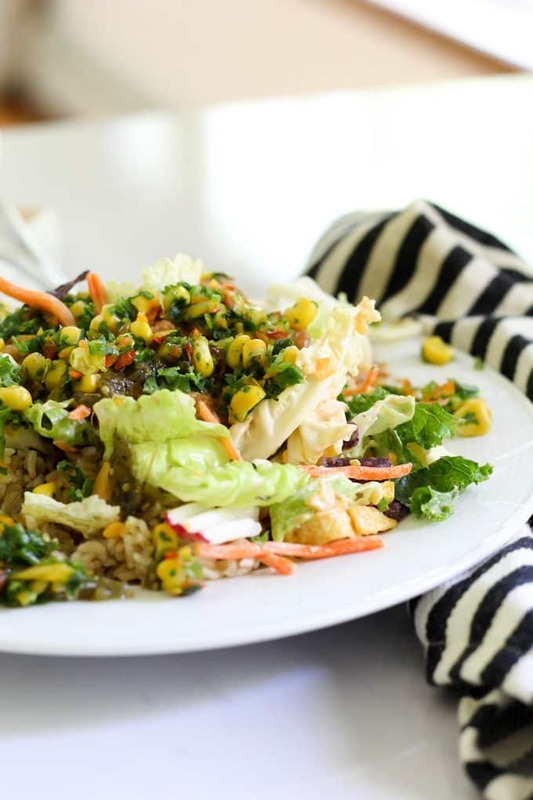 It is so simple to thaw a bag in the fridge, and then just heat it up to serve over this salad. To create the Unwrapped Burrito Bowl I started with instant brown rice on the bottom of the plate. 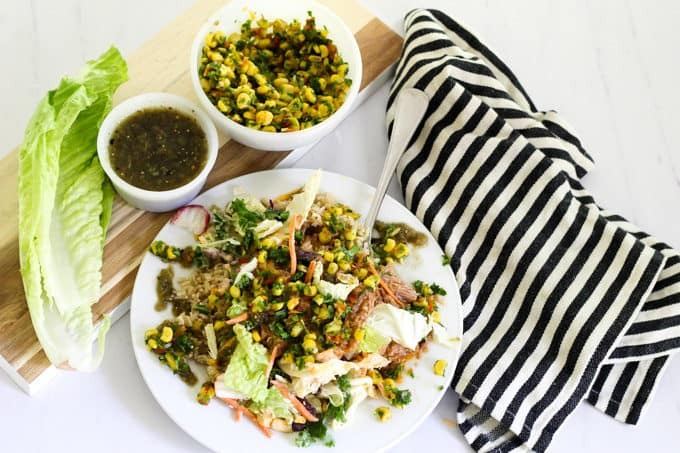 Then I piled the Southwest Vegetable Salad Kit, the Pork, and then topped it with my favorite corn salsa. 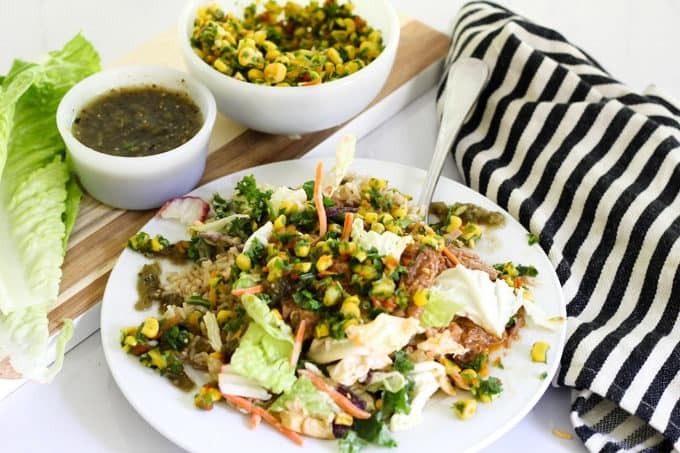 I make this corn salsa almost weekly, and pretty much always have some on hand. Once the rice, salad, pork, and corn salsa was all put together, it created the most amazing unwrapped burrito. The carrots, radishes, and cabbage really added a lot of flavor. It also made this SO simple since I didn’t have to chop any veggies and I already had the pork and salsa made. I also added some green salsa to the very top of the dish. I’m not particular about which type of green salsa I use, I just grab whatever I see at the grocery store. I wanted to mention that if you weren’t concerned about cutting calories, this would be just as good in a tortilla, or “wrapped”. To help us meet our calorie counting goals though we opted for the unwrapped version. 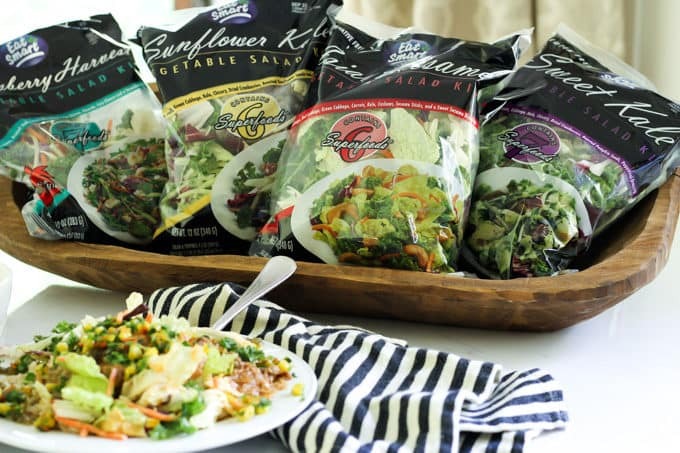 If you’re looking to spice up your salads, any of the Eat Smart kids are a great solution. 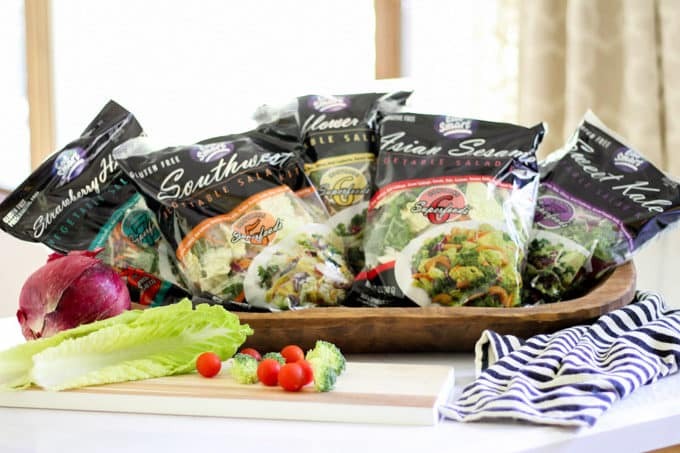 To find the Salad Kits you can use their Store Locator. 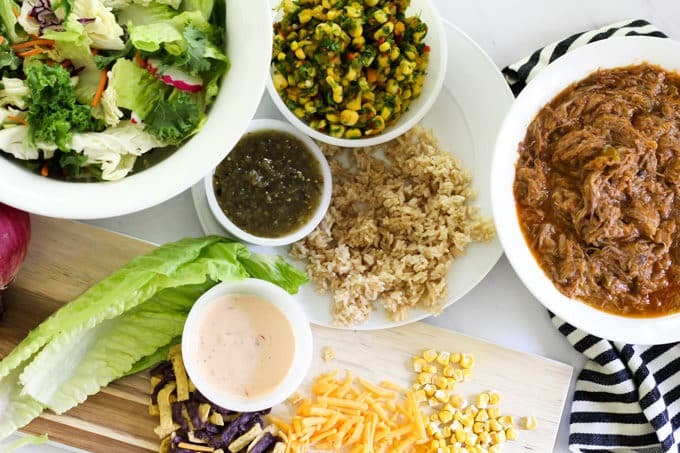 You can follow Eat Smart on Facebook, or sign up for their e-newsletter in the contest below. They will be giving away ten AMEX Gift Cards for $50 each, along with samples of all five Eat Smart Gourmet Vegetable Salad Kits! Looks great Jess! 🙂 Thanks for the recipe! Absolutely! Thanks so much for stopping by and reading!